This bike does 100mph in 2nd gear. Good choice for a first bike? I am fortunate enough here at SCPR to meet and train riders of all ages and experience levels. I’m always interested in folks’ path into motorcycling in terms of what machine they started on. It tells me a lot about the sort of rider they are, even before I’ve seen them turn a wheel on a bike. All riders come to SCPR on all sorts of machines – from 125cc beginners to 1300cc Harley’s, but the universal truth about almost all of them is that whatever the bike they are on, they’ve adjusted themselves to the machine to make riding it work. But it really should be the other way around. The machine should be responding to your control – not the other way around. Most riders that come to SCPR, even the ones who have been riding for a while, aren’t even scratching the surface of their motorcycle. They ride gingerly and tentatively, not going anywhere close to the capabilities of their bike, keeping it strictly in a comfort zone inherited from their car-driving world. This leads to most folks riding their motorcycle exactly like they would drive their car. I’ve lost count of the number of evaluation runs I’ve done up the twisting Stunt Road in 4th gear at a constant speed of around 35mph…. My job as as advanced rider coach is to get folks out of this bubble and start to explore handling and riding their motorcycle properly. That doesn’t mean riding it faster. It means teaching students the dynamics, mechanics and physics of two-wheeled motoring and having them explore this new world for themselves, while giving them coaching and encouragement at every step along the way via radio. Every student I’ve had has responded to this admirably and it’s always rewarding to visibly see my students’ confidence and control growing with each run we do. But as with every task or journey, we need to make sure we select the appropriate tools for the job and ones we can operate with a reasonable degree of confidence. If you had to lop a twig or two off a tree, a simple handsaw would do the job. You hopefully wouldn’t take a chainsaw to it. Not only is that tool massive overkill for the job at hand, but if you didn’t know how to operate a chainsaw properly, risk of injury would be high. It’s the same with your first bike. I see all sorts of questions on motorcycling forums and social media of newly licensed riders listing off a string of machines under the question of “which one of these should I get for my first bike?”. The list is usually eyebrow-raising. Yamaha’s FZ-09 or FJ-09, Kawasaki’s Ninja 600, Suzuki’s GSXR 600, Ducati’s Monster – I could go on but none of these bikes are beginner machines. They are big, heavy, extremely powerful and require a decent amount of skill and experience to ride properly. 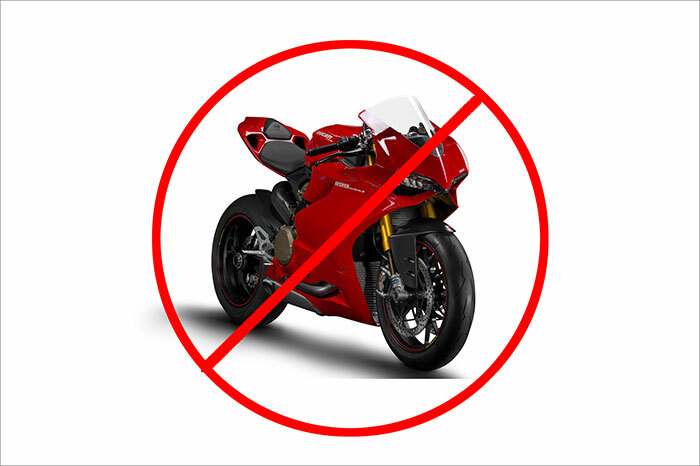 It may be tempting to jump straight on your dream Panigale – but the fact is, as a new rider, your skillset is nowhere near the level it needs to be in order to ride a bike like that the way it was designed to be ridden. Sure, any rider could do leisurely runs to the shops on it (although if that’s what you want to use it for – why on earth are you on one in the first place??) but in order to take a machine as advanced as that anywhere close to it’s limits and capabilities, you need an equally advanced skillset. So how do you learn that skillset? I think a lot of folks are tempted to answer “just buy the dream bike and work your way up” but this is a huge mistake. The gap between your skills as a new rider and the size and performance of your dream bike is just too big. Often insurmountably big. Take the Ducati at the top of this post. As the tagline says, that bike does 100mph in second gear with four more gears still to go. The power is all up in the upper end of the rev range as well, so it takes a lot of skill (a new rider doesn’t have) to access it and then it’s too much power when you do, if you’re new. Ok so what about the big cruisers? Heck – it’s SoCal and I want to cruise up and down PCH on a weekend! Where the Ducati is extreme in terms of performance, the cruisers are extreme in terms of their sheer weight, bulk and size. It takes a good deal of skill and experience to ride a machine weighing close to a ton; skill and experience you simply do not possess early in your riding career. Those bikes are also hugely expensive to fix if you scratch them or drop them (not to mention almost impossible to pick up!). It’s always better to start on something small and light and preferably 2nd or 3rd hand. These “beginner” bikes are a much better match for your beginner skillset and by being much lighter, they are far easier to handle and control. Since they aren’t new, insurance is much cheaper and it’s not going to matter if you drop or scratch them. Aside from anything else – hopefully your riding career will last for many years, so what’s the rush to get straight on a big, powerful bike? Your riding career will depend on the time and sense you invest in it in the early days. Get on a machine too powerful or large and you’re likely to scare yourself silly on it to the point where you simply jack riding in altogether. The simple fact is, when you are a new rider, your skillset is also brand new. Like any skill, it takes time and effort to get better at it. So match the bike you buy to the skillset you have. This will allow you to build up your skills and experience, and as this increases, you can confidently move up to the bigger bikes. Once you’ve completed the MSP course, I’d suggest continuing on the sorts of machines they provide at the MSP school. Most folks coming off the MSP will only have been riding for the two days the course runs to, so take your two days of experience and apply it to the same sort of bike they use at MSP schools. A bike anywhere between 250 and 400cc and any of the Japanese brands are usually good buys. Bullet-proof reliability, cheap to run and insure, they offer plenty of performance and are excellent machines to start learning your craft on. Your body and your riding career will thank you for it. This entry was posted in General on September 24, 2018 by mc_admin.